#ParkSmartAZ is a common sense approach to protection, the simplest and most cost-effective way to thwart would-be thieves. Before you park your vehicle, look to seee if anyone is just standing around watching people or someone, something seems out of place. Trust your gut. If you do not feel safe parking there, it might not be a good place to park. Acknowledge people looking your way- even if it is a simple as nodding their way. Thieves don't want to be noticed and often times will be scared off if you get too good of a look at them. Look to park your vehicle in in well-lit areas and avoid allies, and areas that have little to no foot traffic. 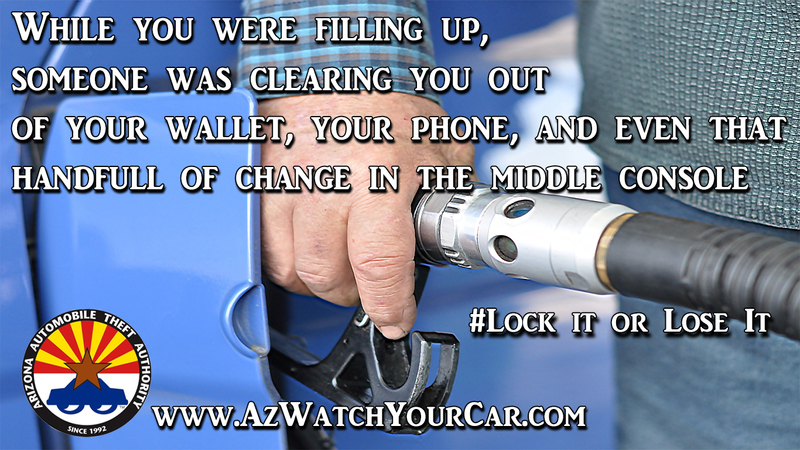 Lock your car - half of all vehicles stolen are left unlocked. Take your keys and key fobs - nearly 30% of all vehicles stolen have the keys in them. This includes spare keys too. NEVER leave your vehicle running or unattended, even for a moment. Pets and children should never be left in an unattended car. Remember #ParkSmartAz can be used at anytime, anywhere including your home, office, or even the gas station!